It’s all pretty amazing when things start coming together. I mean, you plot, you plan and you dream and you try and cram the plotting, planning and dreaming into reality, dodging around obstacles like time, money, weather, differing ideas, legal requirements and everything else and you hope to come up with a workable situation that hasn’t strayed too far from your first inspired musings. 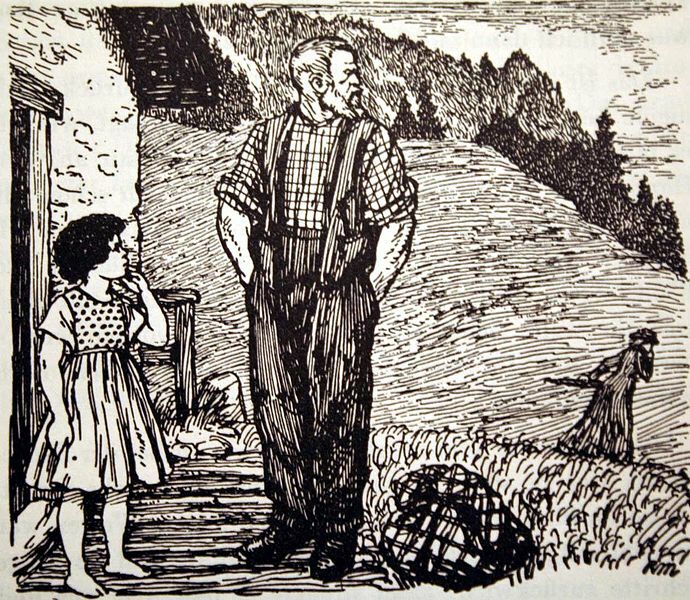 My initial dreams involved up to 5 acres, an eco friendly house built by my own two hands, robust and healthy children who look liked they had escaped from Heidi, friendly animals, beautifully landscaped (but not rigid) gardens and fresh produce pouring from their richly composted soil. The reality is a little different. But it’s the greenhouse I am most amazed with and proud of in our garden. It’s a Sproutwell greenhouse built from a kit I bought off eBay (they also have a website and the price is the same) and the garden beds I built myself using corrugated iron and hardwood corner posts. The hardwood we already had and the iron, bought from my uncle, makes each bed cost $1.50! WIN! 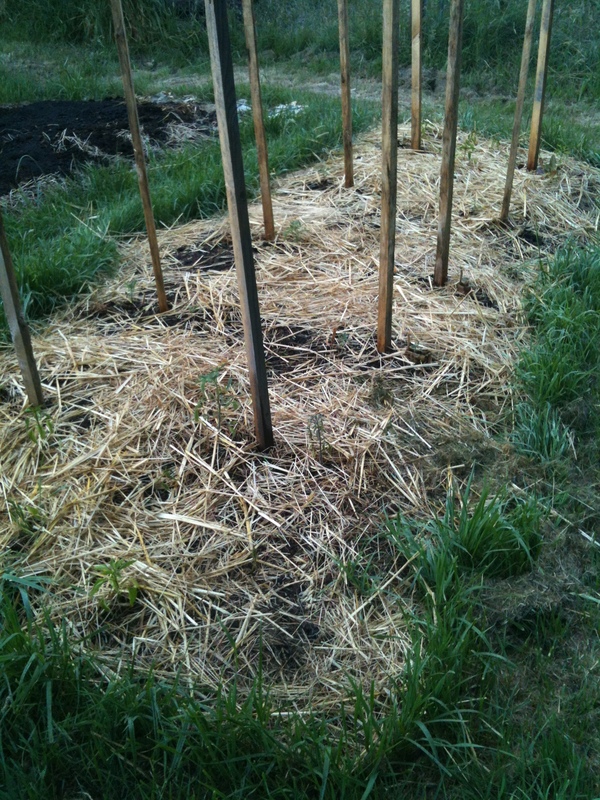 Anyway, I’ve built 3 beds in there and filled and planted 1 of them. I transplanted the tomatoes from the second martie bed as they were very small and not going to make harvest before the frost arrived so I had nothing to lose. I planted my mandarin, banana and lemon trees in there first, then the transplanted tomatoes and transplanted marigolds in there, some beans planted down the side, transplanted capsicums, rocket seeds between them, then planted carrot and radish seeds, some spinach seeds, leek seeds, coriander seeds, transplanted chives and also chive seeds. 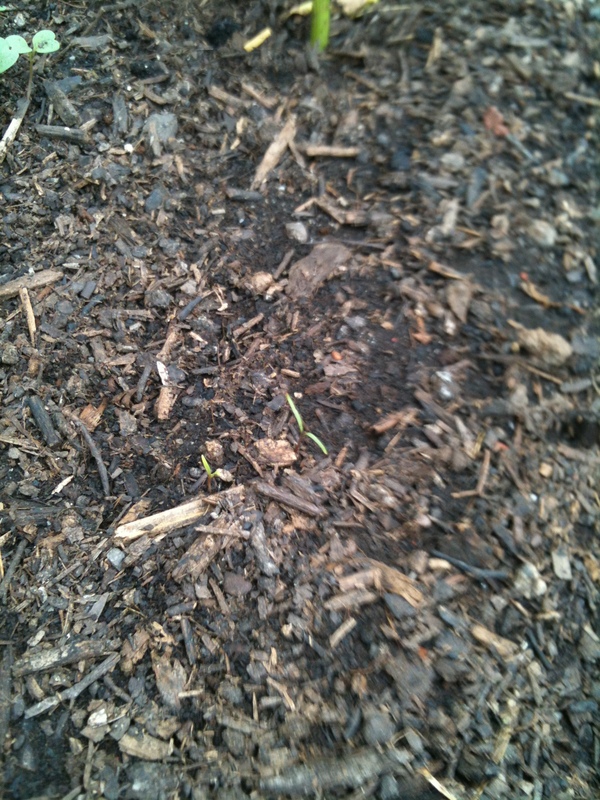 So far the chive seeds are the only ones I haven’t seen a sprout from yet. 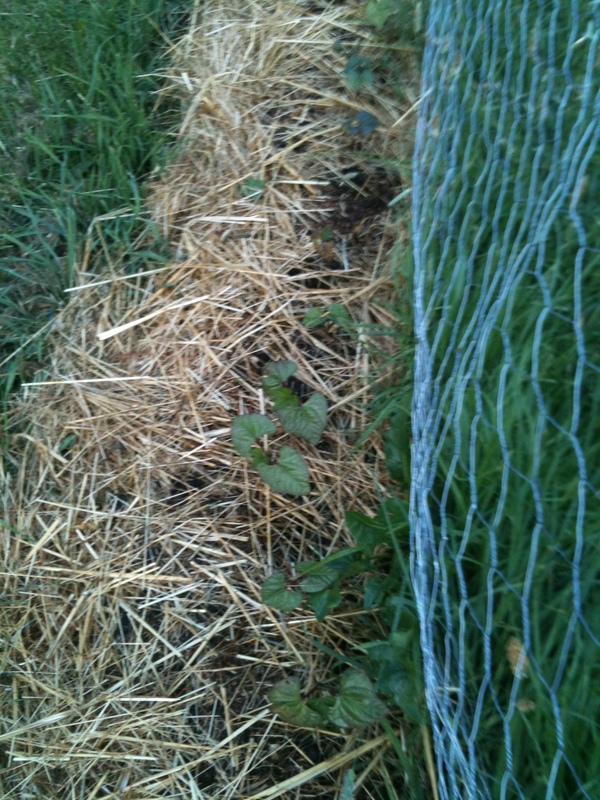 I also transplanted in a pumpkin that popped up from seeds I’d scooped out of a pumpkin around Christmas time and planted out mid January. 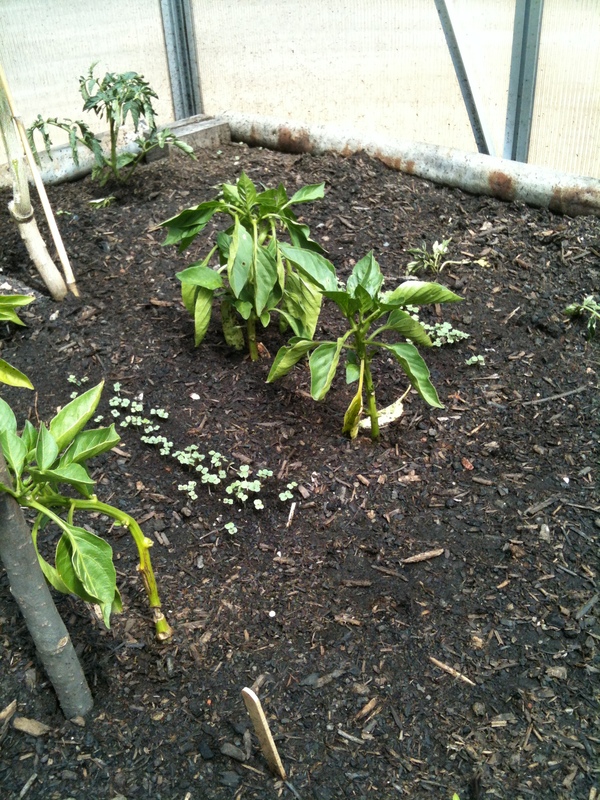 So, although it’s not yet that verdant oasis, it is well on its way to being a nifty little food garden. Capsicums and rocket with a tomato and the beans in the background. The carrots are near the icy-pole stick. I also did some more unpacking – DVD’s away (not that they will see much use given the lack of tv), my crystal radio set up and working (I need to find a better station with some music although ABC news radio is ok too), and I’ve been knitting away getting clothes ready for winter. 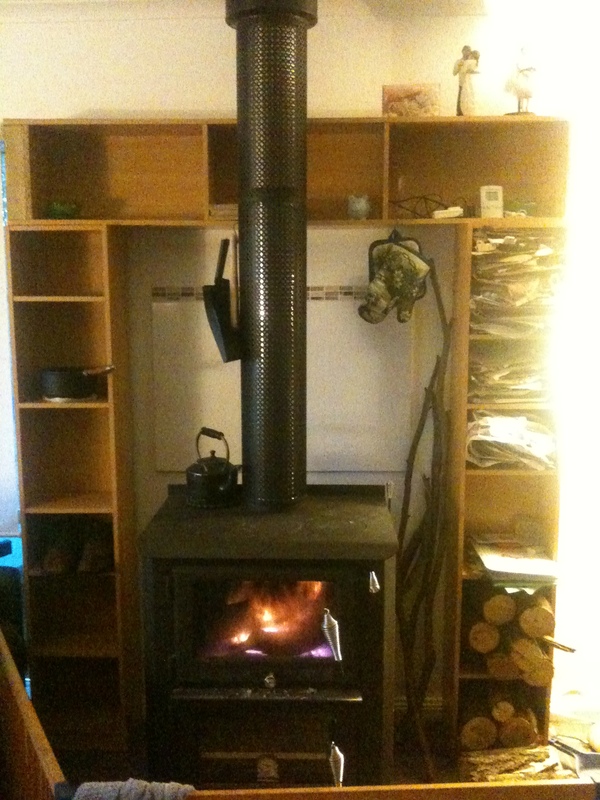 The kids each have a new hat and I’ve made a scarf for Orik too. I need to source some more yarn to make Allegra a scarf so it’s time to dig into the stash. I also knitted my first dishcloth using this pattern and I’m happy with how it’s come out. Now to test it and see how it works. Our food is improving on a weekly, if not daily basis. I’ve committed to making sourdough pasta using this recipe so we are slowly using up our normal pasta which I can’t eat and once it’s gone, that’s it. We’re now drinking real milk, our veggie box arrives each week from Highland Heritage (I highly recommend contacting them if you’re local and interested as their produce is first rate) and I’ve started culturing milk too – milk kefir is like super dooper yakult and it tasted a HEAP better as well as being heaps better for you. Google kefir if you’re interested. I just don’t know enough about it at this stage other than to say it’s very good for you and not unpleasant to taste. 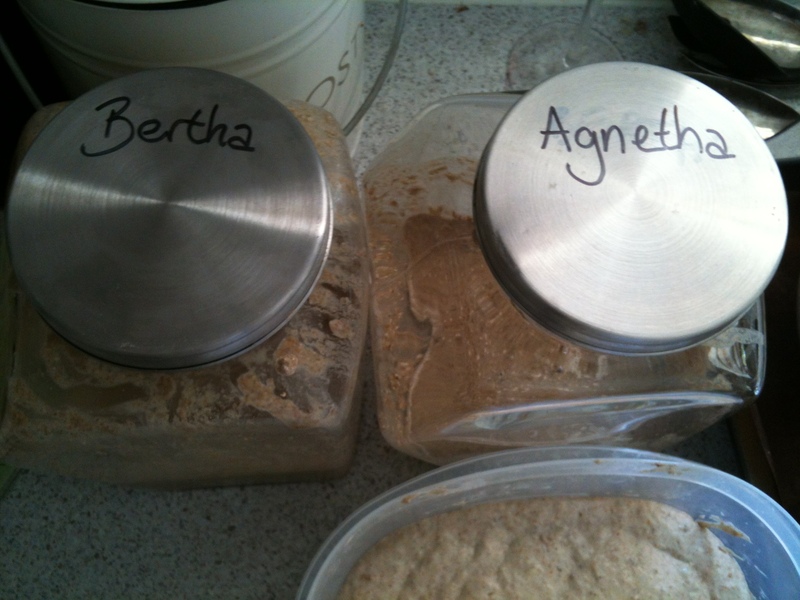 My Bertha, Agnetha her daughter and the tub with my bread in it at the bottom of the picture. A Dexter. Photo is not such a good one of the cow but gives a brilliant idea of their size. So anyway, that’s the updates for now. There is lots happening, lots in the pipleline and many many more things on the discussion table. It’s a busy time and I’m loving it. 😀 What’s the news in your slice of paradise? And this is why I make my own! 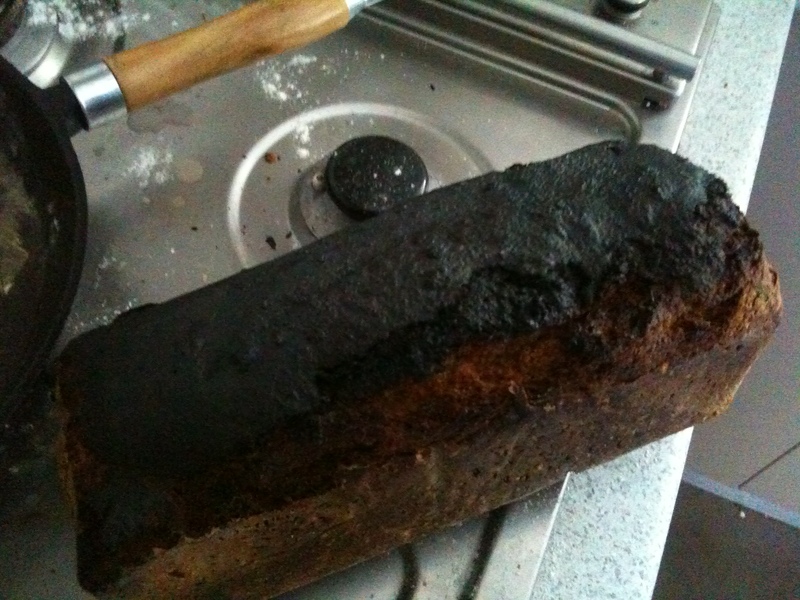 I bake my own bread. I have done for a few years now, even before the arrival of Hermy the Thermy. I love that my whole family LOVES the bread I bake. I either make sourdough white bread or a sourdough home-ground spelt and white bread, depending on whether Thermy has just been washed or not (if he’s wet I have to spend the time to get him bone dry for grinding grains and that depends on available time and motivation at the given moment. 😉 ) but either way I know EXACTLY what goes into each and every loaf I bake. Even before I made sourdough bread I baked at home, firstly using my mixmaster to help with at least some of the kneading and then usually putting in some time to hand knead too and then after the arrival of Hermy I’d get him to do the hard yards, both grinding and kneading. Now I still use his skills for mixing and kneading but the dough itself does the work for me as I use a no-knead technique which works beautifully as it also allows for souring time. Win all round. I bake my own bread for several reasons. Firstly, with a history of gluten/wheat intolerance in my family and finding I have my own issues with eating plain wheat breads it is cheaper and tastier to bake my own sourdough than buy traditional supermarket gluten free breads. Secondly, I enjoy it. Some days I can’t necessarily be bothered making the dough for the fridge (that’s where the no-knead dough lives whilst it kneads itself) but then I think of the wonderful benefits and taste of my bread and that never fails to motivate me, which brings about the third reason. Fifthly, I bake it because I can. I don’t like to buy things that I can make myself. Call me a rebel but if I can “damn the man” in anyway possible, I do. 😀 As soon as I find something I think I have to buy I will have a good go at making my own just so I don’t have to give any more month than absolutely necessary to the big supermarket chains or large companies. And sixthly, because I don’t trust the big companies, or even many of the smaller ones. At risk of sounding like some crazy conspiracy theorist (which I probably am to be honest 😉 ) I don’t trust their ingredients or intentions (beyond making as much money as they can) as far as I can spit! THEY don’t care about the health of my family beyond the level that means I can’t sue them. If they can get away with it and it’s not illegal then they will do what they can if it makes them or saves them money. (Read this as a perfect example). Anyway, this morning as I was acquainting myself with the flood and fire news of our country I came across this clanger! Now, bread, even homemade bread is at least vegetarian (some recipes use milk, butter or buttermilk) and I know mine is vegan (discounting harnessing and using the yeasts) but these articles, this one that I read some time back and this one I read this morning share that bread is not even vegetarian and in some cases, somewhat cannibalistic! YUK! If I want to eat hair I have plenty of my own thanks and I KNOW what products and chemicals have been used on it. As for chicken, if I want chicken I prefer it without the feathers and again, from sources I know! And NOT in my bread thanks. Reading the second article this morning simply served to back up my beliefs that you cannot trust corporations in many cases as far as you can spit and the FSANZ is no better. These are the people that okayed BPA after all and didn’t even know that Canada had banned the use of BPA So I’m pretty convinced they aren’t doing their jobs to be honest. It all serves as a warning though that we cannot trust the government nor corporations to do what is best for us personally. 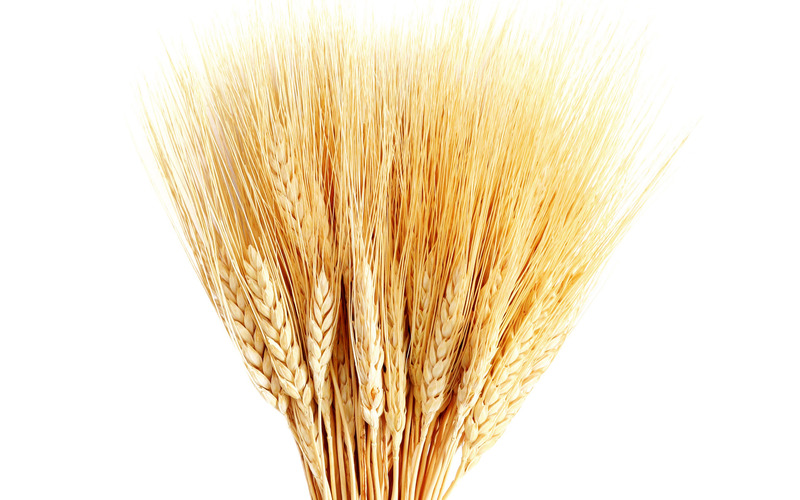 They are balancing economics into the equation, just as we all have to do but their economics are in the millions and billions so the inclusion of an amino acid extracted from human hair or chicken feathers in our bread is probably not even a blip on their radar. We need to look and research for ourselves! It can make it a long and tedious (or more tedious) job to do the grocery shopping but if we want to avoid eating foods containing compounds of dubious origin or preservatives and food colourings with questionable research into their effects then research we must or simply, never purchase anything but pure raw ingredients. That’s rather difficult to do (mostly yes but entirely?) so reading and research really is quite necessary in order to avoid ingesting these sort of things. I will say one thing for conventional and supermarket purchased foods though. They can NEVER be accused of adding to the taste of foods. 😛 We had a friend stay over the weekend and I cooked up a biodynamic corned beef I had (ok, I corned a silverside cut for the pedantic 😉 ) and served it with organic green beans, mashed potatoes with parmesan cheese, carrots and organic turnips and I must say ALL the flavour was in the turnips and beans and they beef was ABSOLUTELY AMAZING!!! I have NEVER had corned beef like this before in my life and there is no testament to my cooking there I promise you. 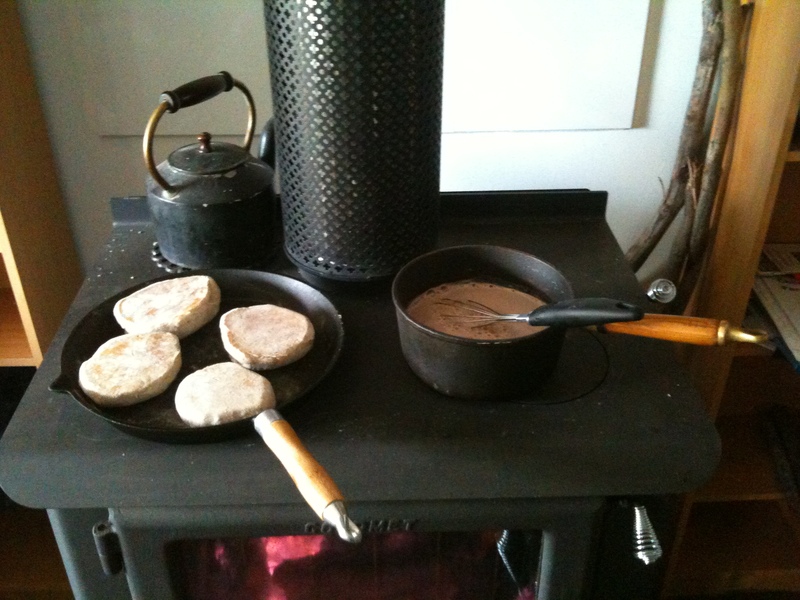 I’m capable of cooking good foods and following recipes but I’m no great shakes as a cook I can guarantee. So, ALL the glory goes to the meat. It was mindblowing! We all ate far more than we should have, followed by organic rhubarb and custard which was also delicious. I can highly recommend spending the extra to buy organic and better yet biodynamic meats. Nom nom nom. I am tired. Exhausted, pooped, weary (my Papa used to say he was weary – sorry, nostalgic moment 🙂 ), worn out, buggered, stuffed, knackered, all done in, fried, zonked, shattered. I am also elated, stoked, happy, pleased, proud, satisfied, contented, over the moon. It’s been a busy weekend. 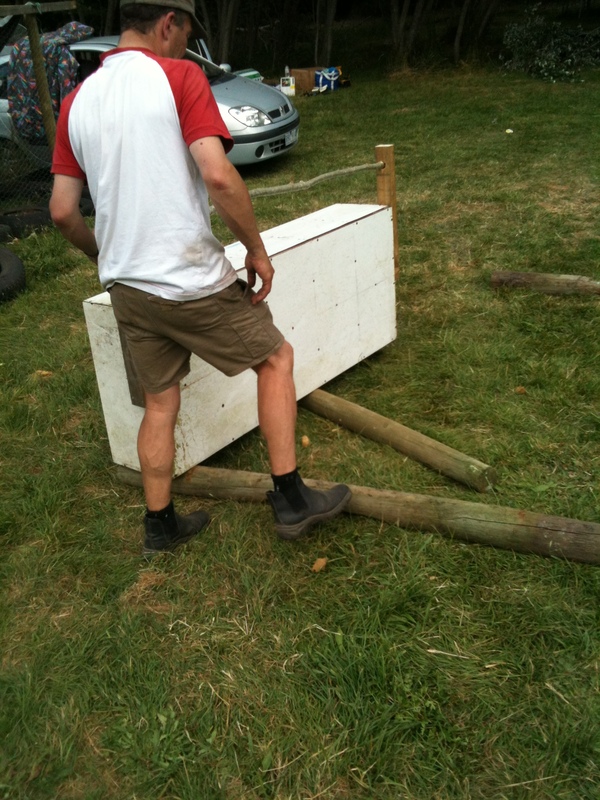 Achievements this weekend include finishing the chook pen. Ok, so it’s not quite ready for them to move in but the fences are el completo, the door is up, although not yet lockable and the nesting boxes and perch are in. 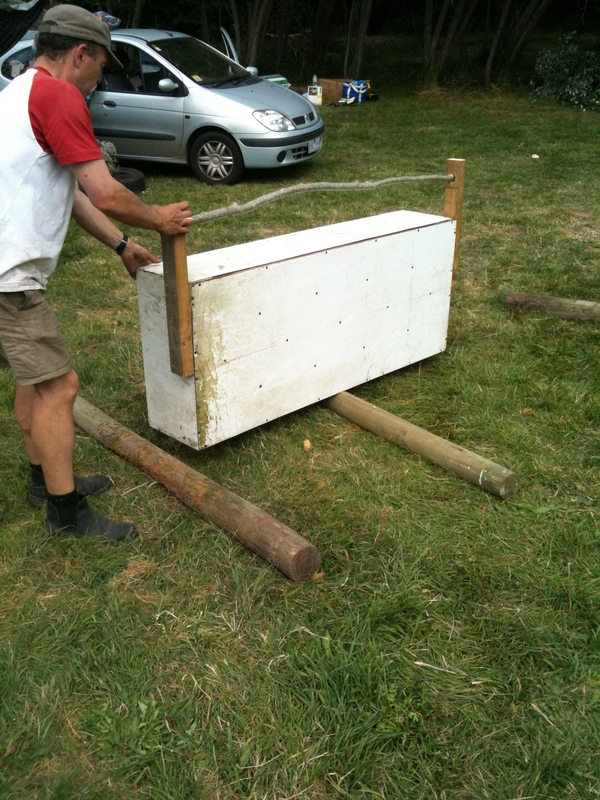 The nesting boxes are an upcycle job from junk existing left at the house. It was one of those shelves that are all boxed in (if that makes sense) so it’s been turned on its side, I’ve attached (ok, Martin attached) 2 bits of 2 by 4 to stick up in the air and after a large hole was drilled through, a piece of chopped down poplar branch was jammed in and drilled into place. Total cost? A few cents of electricity to run the drill and a few screws, non of which were actually bought for the job but lying around from previous jobs. 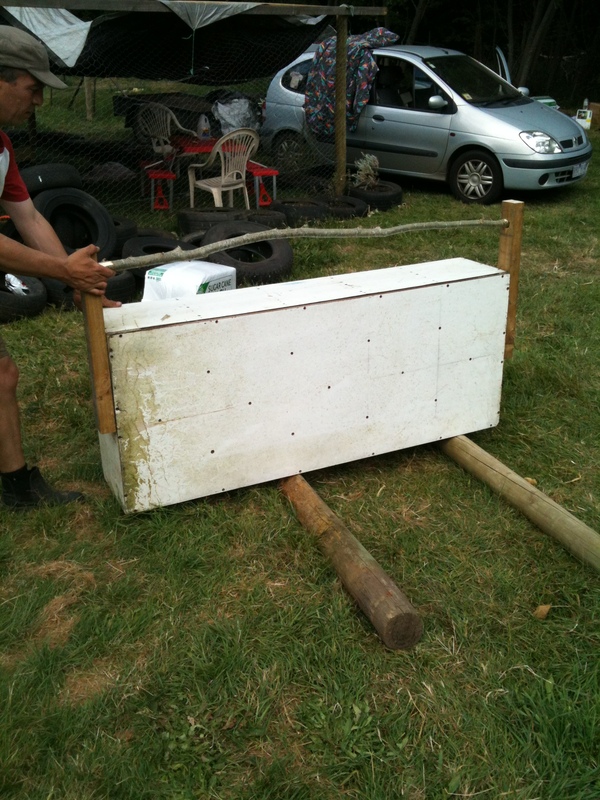 It weighed a tonne so a bit of Egyptian engineering helped us manoeuvre it into place. Martin also managed to get Trevor working again. He’s since mowed most of the grass flat again and made it worth while digging out the whipper snipper again too. 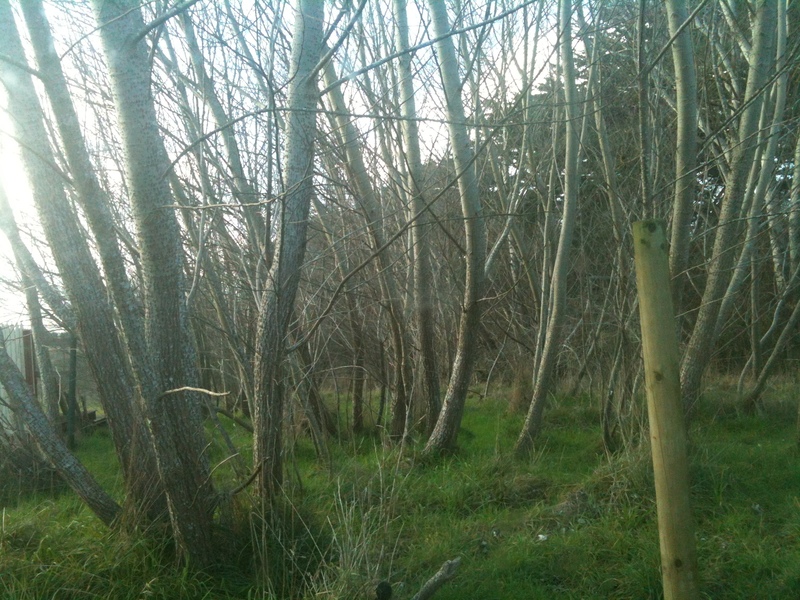 The garden is looking a LOT neater and the snake risk is much lower. This has definitely been on the brain a lot of late as there is a snake road kill on the road into town that has had us both on the watch. Now that the grass is too short for them to hide in though we are both beginning to relax. Well, at least a little. Sadly, Trevor hit a stump and broke the belt that runs the mowing attachment. He can’t mow right at the moment but he’s earned his keep hauling a hole lot of crap and junk out of the creek. Sadly the fallen tree was a little too ambitious. Worth a try though. 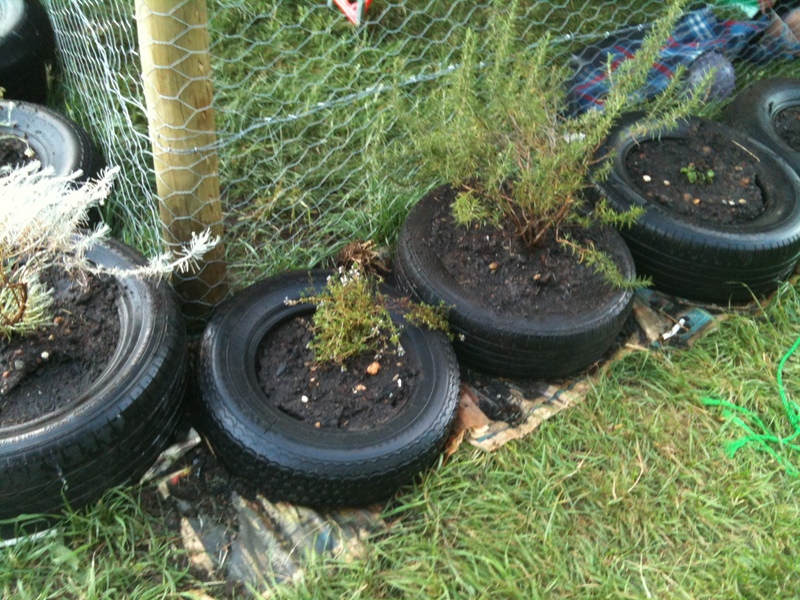 I also got stuck into some planting. 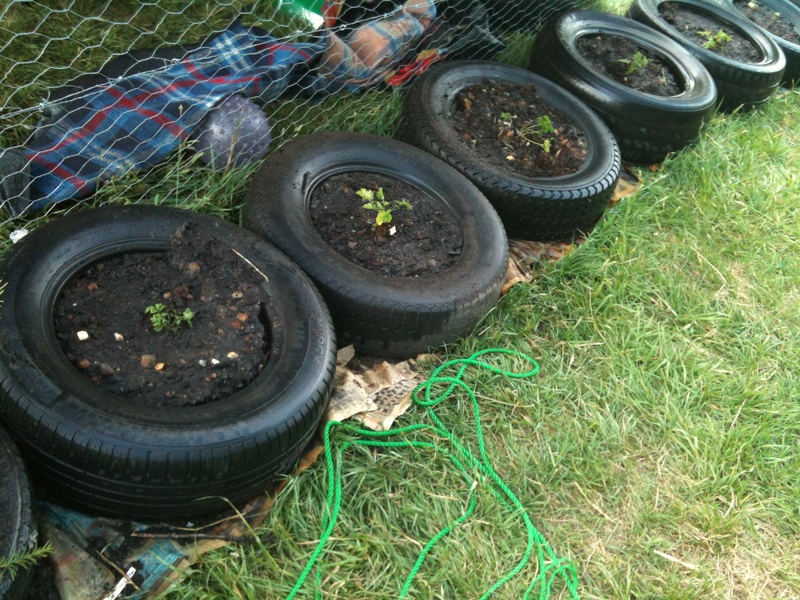 With the help of a few more loads of soil, the north and east sides of the chook pen are tyred in place (take THAT Mr Fox) and planted out too. 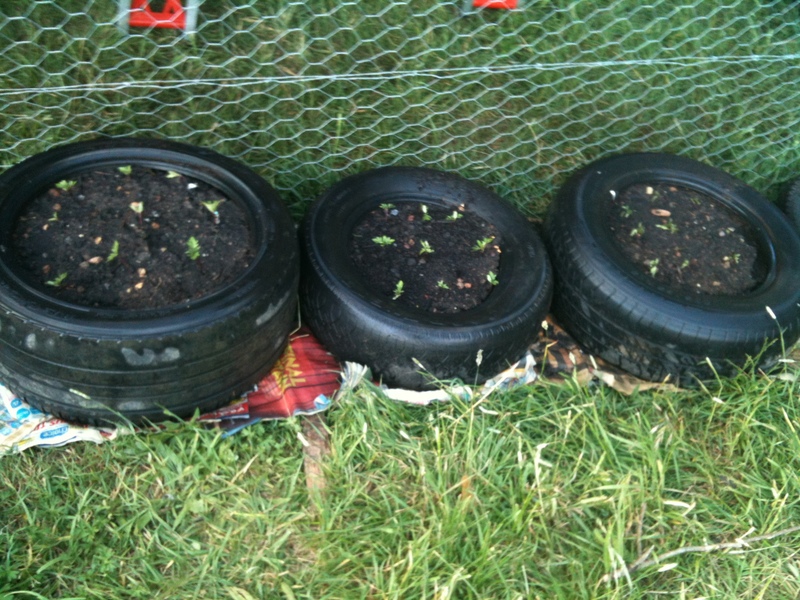 There are a few tyres on the south side so, planted in anti clockwise order are: 3 tyres of marigolds, oregano, curry bush, thyme, rosemary, 2 with pyrethrum, curly leaf parsley, 2 more pyrethrum, then the rest either have sunflower seeds or sunflower seedlings planted. They will become chook food once ripe and hopefully a wonderful beneficial bugs only invite too (no shirt, no shoes, no service unless you’re a beneficial bug 😛 ). 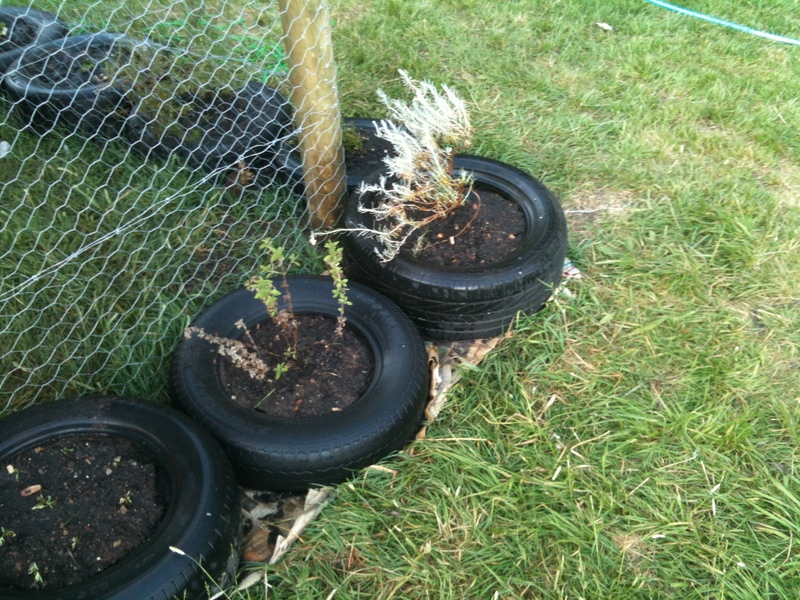 My pot-bound and water starved oregano has responded well to being planted and watered (funny about that) and the curry bush I struck from a sprig a few years ago. 2 pyrethrum, a parslet looking a bit sad and sorry for itself and 2 more pyrethrum. They will make a wonderful and natural organic and safe insecticide. Well, safe for us anyway. Sorry bugs. 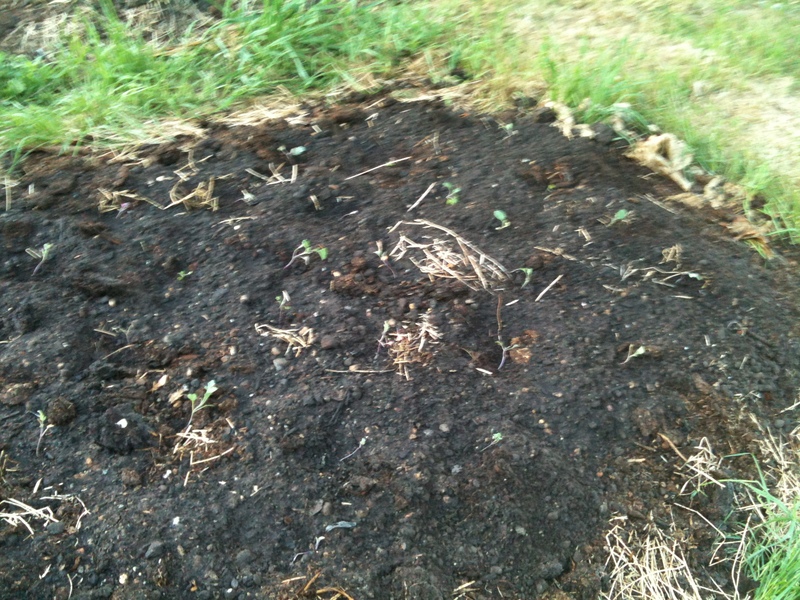 I also planted out another of my no dig beds. 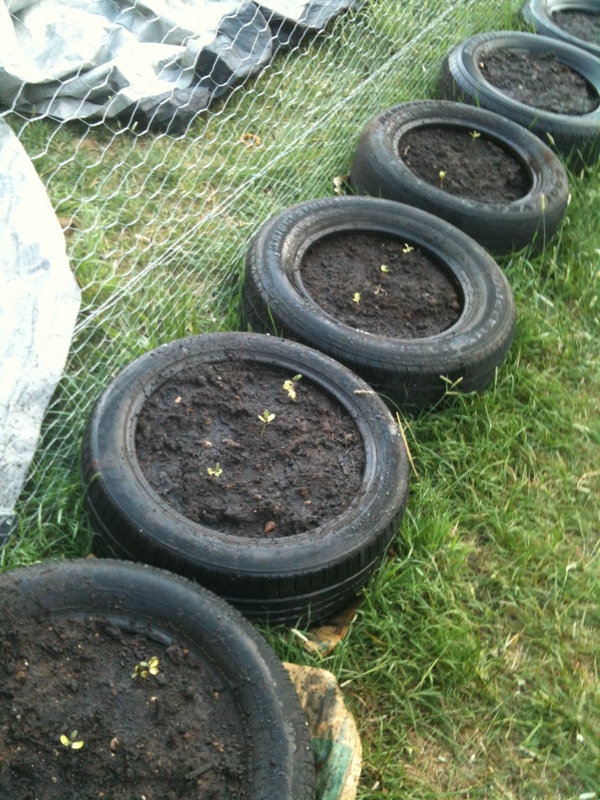 This one is currently half full of purple sprouting broccoli seedlings. 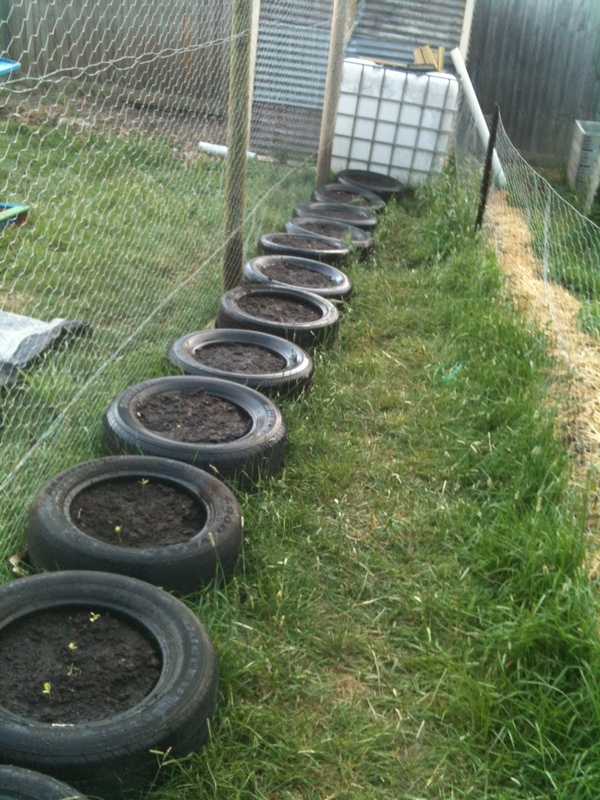 I will add some other brassicas in there too to fill up the bed. 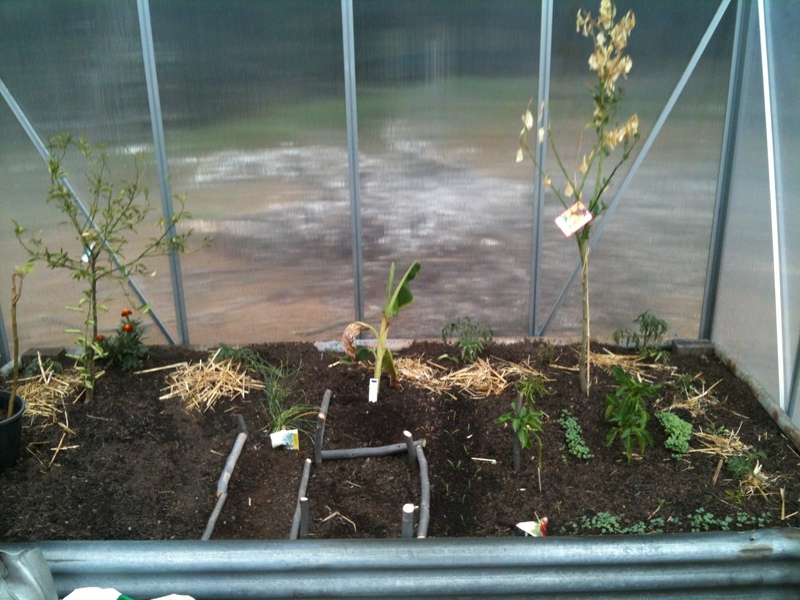 Only one more to plant out now, the second tomato and capsicum bed. 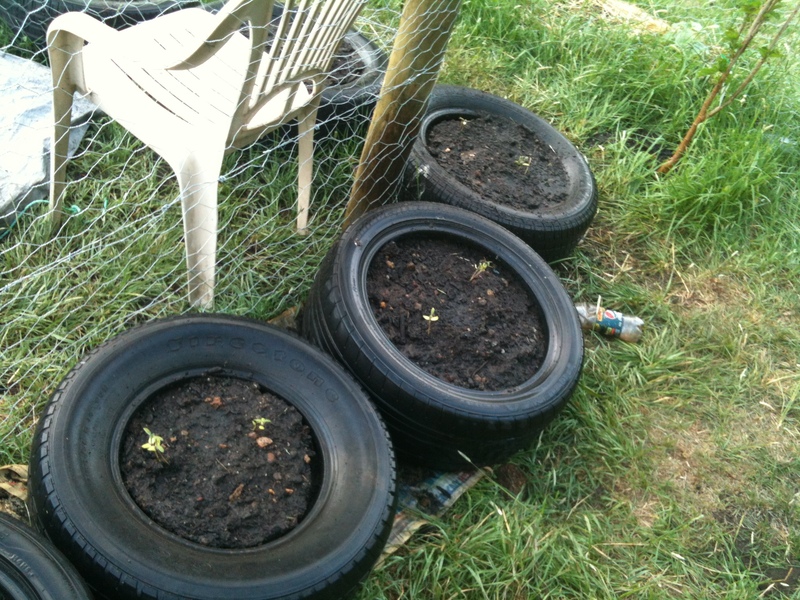 I’ll also be planting some more marigolds in there as they are of assistance to tomato plants from what I’ve read. The tomatoes all got a water with Epsom Salts too. It’s supposed to be liquid gold for marties. We will see how they like it. 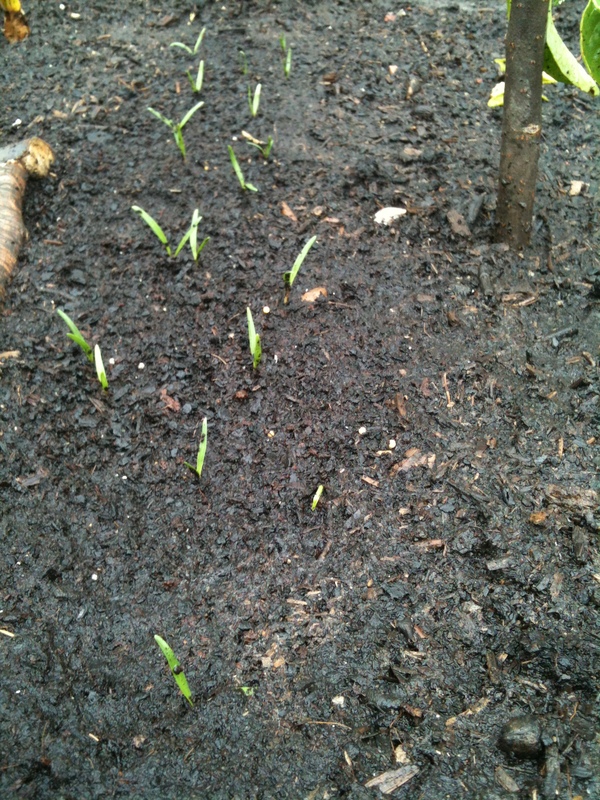 Kind of hard to see and some were looking a little worse for wear but we will see how they go. My tomatoes and capsicums… Some are doing really well but some of the capsicums are looking pretty sad and some of the tomatoes haven’t grown much. 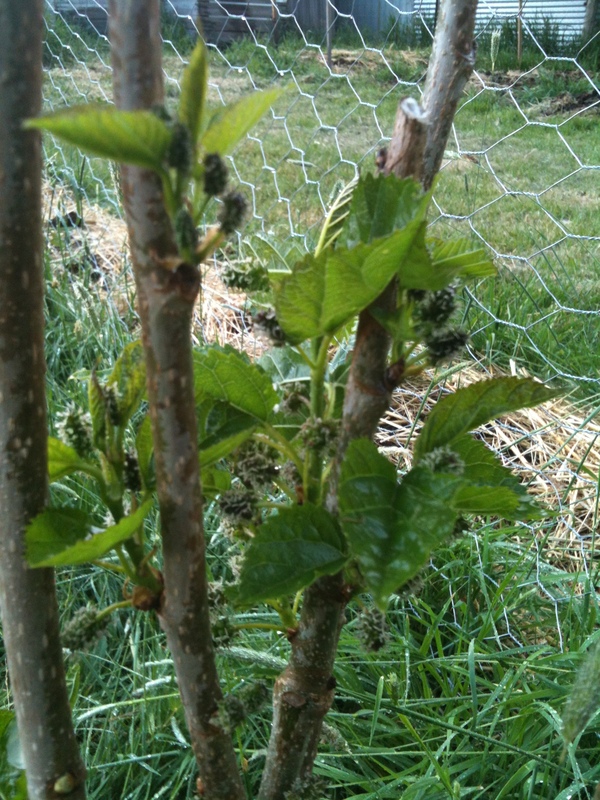 The mulberry tree is absolutely covered in fruit too. 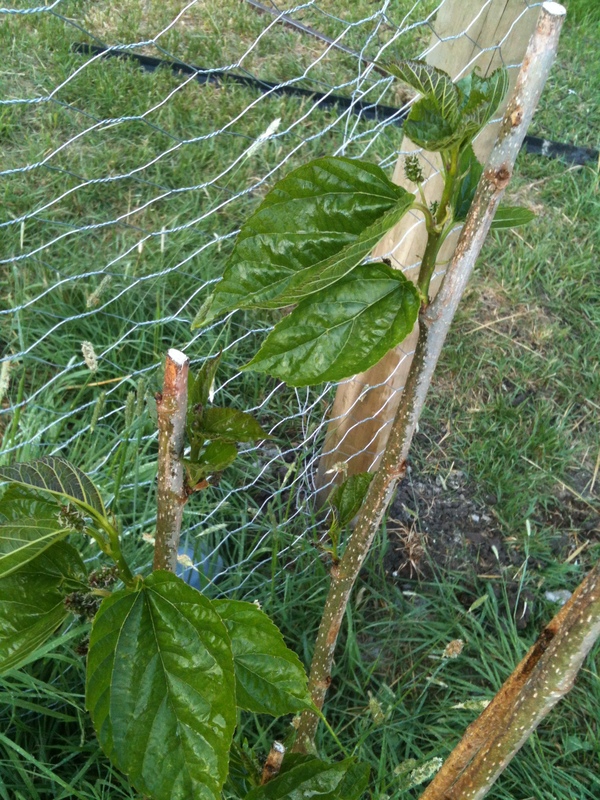 I am most impressed and will be planting a LOT more of them (they’re water hungry which makes them a good replacement tree for the silver poplars and they can be harvested for us to eat (and thoroughly enjoy I might add) as well as providing food for the chooks with any fallen fruit. Not bad at all for its first year planted in our garden. 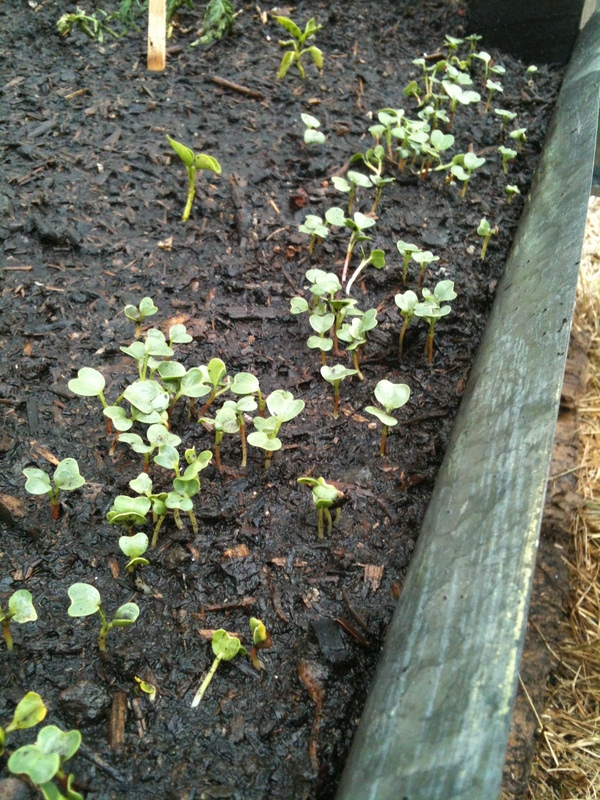 The radishes are growing well and I may also have a few carrot seedlings coming up. 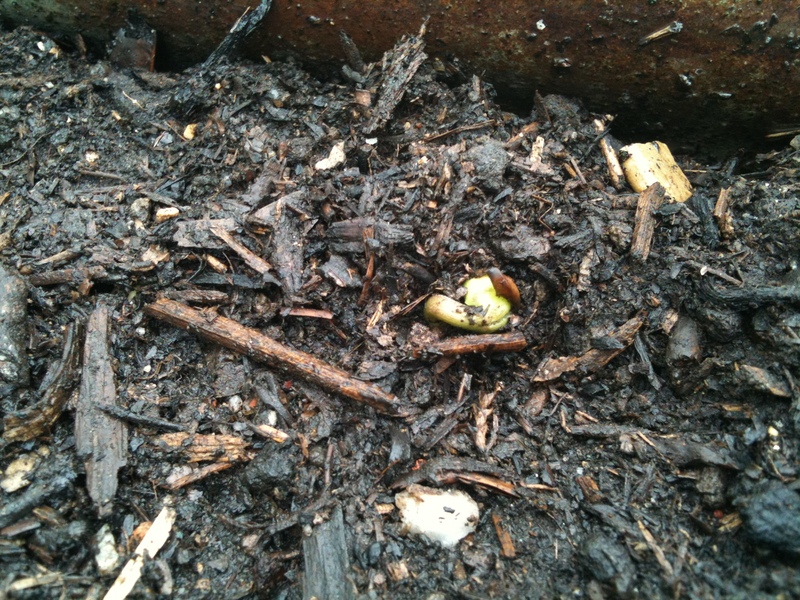 It’s hard to tell at this point and they may well be radish seeds that got washed out of line. Time will tell. Ooo I hope they are carrots. 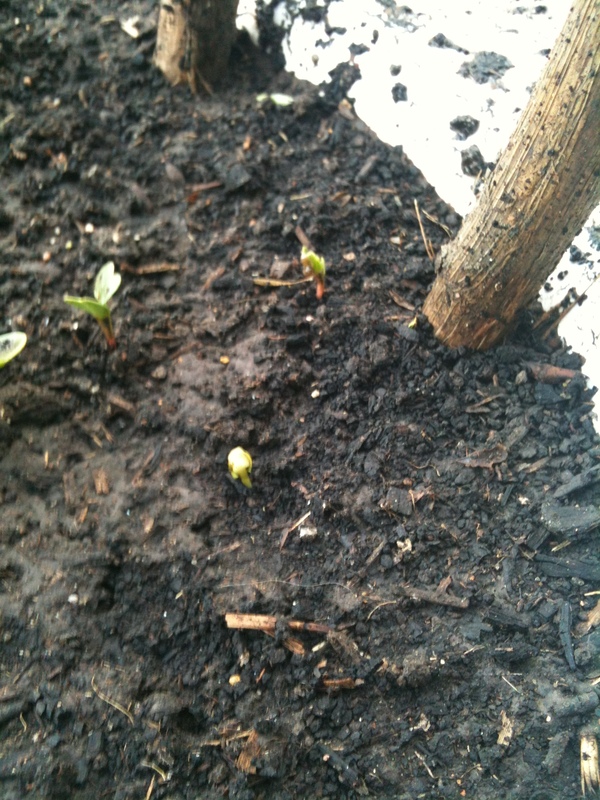 Beans and spuds are doing very well too. The kids have had a ball too. They’ve spent a good deal of time in various states of undress or swimming attire and playing in the half wine barrel of water. They’ve had bike washes (they had their balance bikes and rode them through their bike wash 🙂 ), baby wash (Orik seemed to enjoy it too), a couple of friends over to visit and a lot of running around and playing. I also had the pleasure of meeting one of my blog readers today who is a resident (and a rather new but extremely knowledgeable one at that) of Ballan. I’ve come away relaxed after an hour off from the kids and working, well welcomed to Ballan by jelly slice and a simply divine hot chocolate from Michellez cafe (near the butchers) and feeling like I know some more people and things going on in the community. I was also introduced to some further locals and I feel very much more like a local now too. We discussed blogs too. Check out her blog here. The offers of help have absolutely blown us away too. Thank you so much! Anyway, my brain is totally fried and I can no longer see to type so I’ll pick this up in the morning. 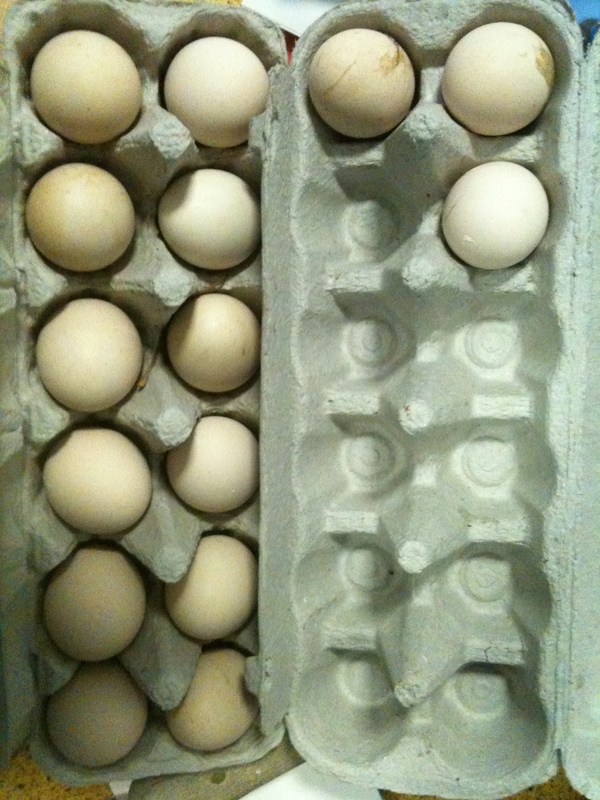 15 pekin bantam eggs to add to the 2 I collected this morning and the 2 others I had in the fridge… I also have 15 organic eggs I’d ordered (Aussie Farmers) before I found the giant haul. 34 eggs. Quiche? I’ve also noticed that more of our ‘fwowers’ are coming up. The ‘sturshuns’ have popped their heads up, the ‘I yisten’ is well and truly up too. I’m hoping to move my seedlings up to Ballan this week as we are at the point I can begin to move up a LOT more boxes so I think we might end up doing a few more trips each week which will allow me to water the seedlings when I’m up there. Well, the morning has disappeared and it’s time for lunch. I have small people reminding me of this fact with increasing frequency. What is it about 4 year olds who are permanently hungry? Bread rising, yoghurt culturing, about to start souring a chocolate cake starter too to trial sourdough chocolate cake (it seems almost anything is possible with sourdough). So, what did you all get up to on the weekend? It’s been a busy day in the kitchen. Just the way I love to start my week too. I have 2 loaves of sourdough on the rise (modified recipe which I shall post if it works well), frozen blueberry and raspberry yoghurt ice-creams in the freezer for the kids, homemade ice-cream freezing, sprouted spelt wheat in the dehydrator, sourdough starter feeding, barm brack and gem scones in the oven, both made substituting homemade date paste instead of sugar, mashed potato with salami and cheese in Thermy for lunch, banana milkshakes, made and I’ve made date paste too. Thank goodness for my Thermomix is all I can say. I love baking. I pretty much hate cooking, the traditional way with saucepans etc, although I don’t mind it so much with my Thermy and I dread the usual “that’s yuck” I get before even tasting from my cheeky wonderful children. Dinner every night is a chore, and one which I must soon address too. 😦 Baking however, I can lose myself in. Even though the Thermy takes away most of the hard yakka kneading and stirring and most particularly so with bread, I still find I have to give it a hand knead or stir and then shape it in to the pan for baking. Bread making. It’s one of those old world jobs, performed in some form or variety, around the world and has been done for centuries. I feel a kin-ship with the women and men of ages past kneading and pummeling the dough with their floury hands. Inevitably Orik wakes and screams his head off right in the middle of the most floury part but apart from that it feels like my contribution to the art that is baking. And I am by no means an artist. I am merely a mimic of the greats. I may tweak and twist a recipe to suit my tastes and needs better but I lack that skill the greats have to recognise when I have created a masterpiece. I strive only to please the taste buds of my family and any friends who have inflicted upon them receive something from my kitchen. Apart from the healthful goodness of home baked and mostly organic bread, including the extra nutrients from freshly ground flour, the one thing that keeps me bread making on a near daily basis is the smell. In my huble opinion there really is nothing better than the aroma of freshly baked bread, piping hot from the oven, turned out of the pan to cool (except maybe the smell of that self same bread freshly toasted the next morning with a hot coffee;) ). My house at the moment is bathed in the aroma of fresh gem scones, cooking barm brack, rising sourdough (it bakes in another hour or so) and the gentle aroma of harvest from the drying spelt.